This quick and easy stir fry is a great option for a quick dinner to use up any leftover vegetables. Heat water and CONTINENTAL Professional Gluten Free Chicken Noodle Soup Mix in a saucepan and bring to the boil, stirring continuously. Simmer for 10 minutes. Add KNORR Thai Sweet Chilli Jam and whisk to combine. Keep warm. Heat oil in a deep frying pan or wok over high heat and brown beef in batches. Remove and set aside. Add vegetables to the pan and cook for 3-4 minutes over high heat until just tender. 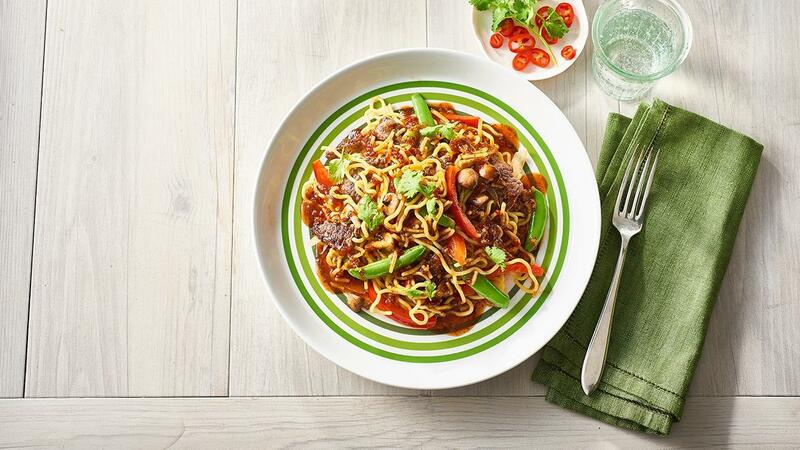 Return beef to pan and add Hokkien noodles. Pour sauce into pan and toss until stir fry is fully combined and warmed through. Serve immediately. Serve with fresh herb salad. Use a selection of left over vegetables to avoid any wastage.